Daniel!! You are like pro now! This looks so great!! Wowza good work man!! Totally gorgeous & amazing work! Congratulations! Wow, I love it! You are very talented. The wallpaper is just perfect, and you have made the whole space look glamorous. The bathroom had good bones, but now it’s alive and happy. God, you are such a badass! Well done. Wow, a new chapter over here with this unveiling of a design job that’s not for you and Max or his childhood bedroom. Lookin’ good, Daniel. Nice balance of style with custom and cost-conscious choices. Was it hard to assemble the light? The reviews on Overstock are scaring me. Ha! OK, it wasn’t *EASY*, I’ll say that, but not hard at all. Just awfully tedious. Basically you just have to hang each strand of crystals individually…it probably took me about 30 minutes per light. Yea this is beyond good!! The chandelier over the tub that goes with the wallpaper…yea awesome! Wow Daniel, you get to design with somebody else money!! And that somebody aint a nobody! The bathroom is beautifull, Ana looks as nice as I thought she was, you have a great talent, it is a sucess!!! Very happy for you! Gorgeous! 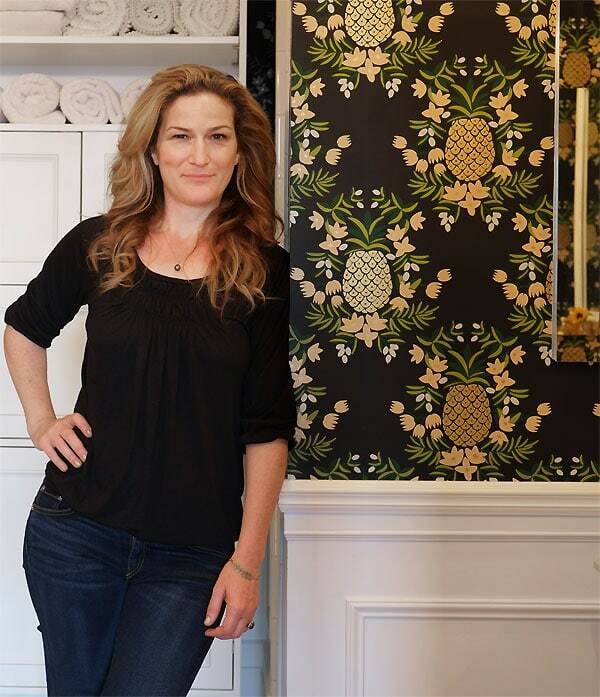 The wallpaper is dreamy and you did such a great job making the room both functional and interesting/beautiful. I’m excited to see more of the work you did in her place! 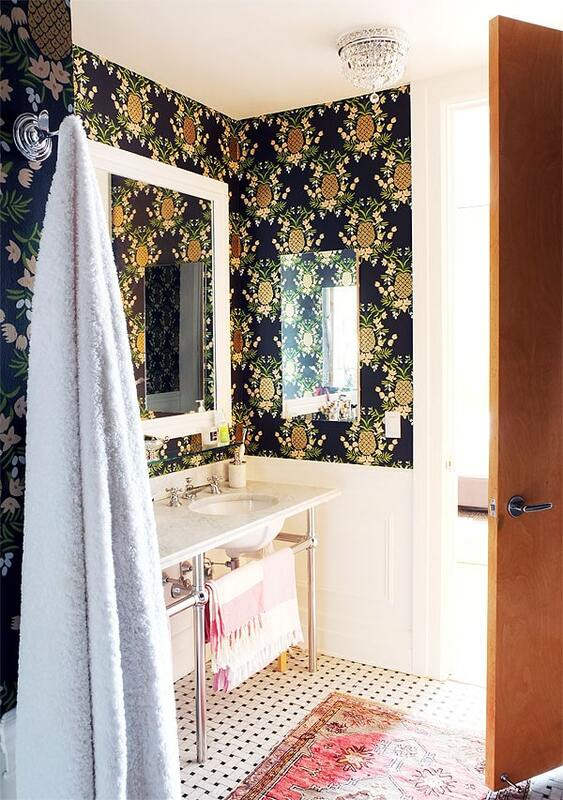 although the bathroom isnt my style, I can appreciate great design when I see it and think you did an amazing job! 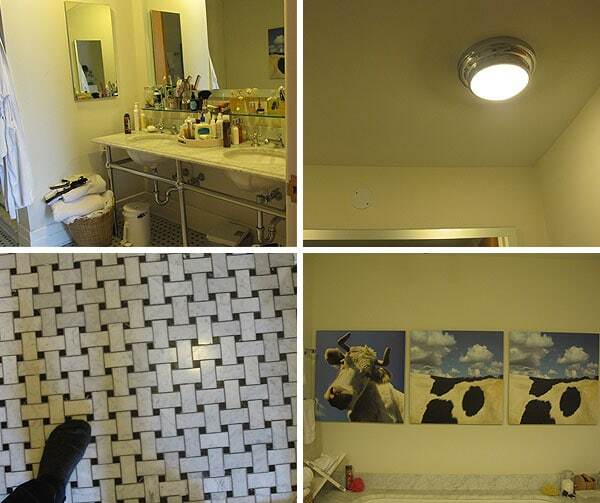 so funny to see her pre-pictures… looks just like any other normal persons bathroom with plastic shoe boxes etc. I absolutely love the rug in your last picture and was wondering if you purchased that as well, and if so, where? Ana actually has had that rug for years, so we just put it in the bathroom! I think she bought it from eBay. I love little antique oriental rugs in bathrooms…they can take a beating and it’s fun to see that kind of pattern and texture on a bathroom floor. Ebay is great for little rugs like that! Looks so nice, I don’t know which one I am more jealous of…having a nice bathroom like that or having the talent to create a room like that…maybe both. You really are brilliant. So much function, and just enough style. How you manage to do over the top and totally approachable and real at the same time – really, brilliant. It’s so wonderful! Congrats! It really is amazing what a little paint or wallpaper and some architectural detail can do to a space. I absolutely LOVE this! and the lighting is amazing too! Hey! Celebrities ARE just like us; I also use Loreal hairspray just like Ana! The bathroom is fabz! So excited to see the rest of the place. I am totally jealous! I wish I had this beautiful bathroom with it’s fabulous design. Were you ever considering papering the ceiling? Because of the direction of the pineapples, I see that might have been difficult to do. Maybe it there’s was a coordinating paper with just the flower lattice, it may have worked. Thank you! I didn’t really consider papering the ceiling…you’re right that it would be a little strange with this pattern, but I also think the room is too small and the ceilings are too low for it to really work here…the wallpaper needs a little breathing room so it doesn’t get too busy and claustrophobic, you know? The paneling on the bottom half of the walls was part of that decision too—I even think wallpapering all of the walls floor to ceiling would have been too much! 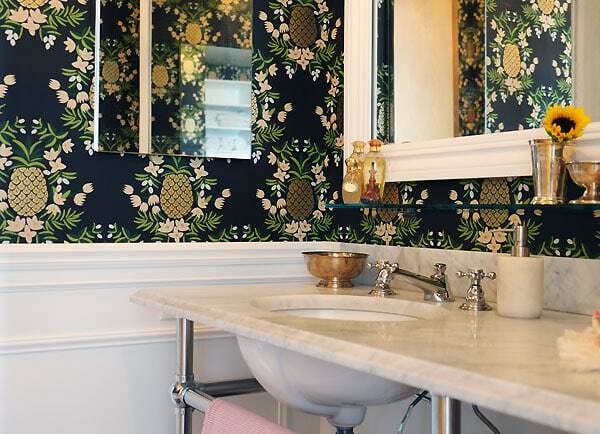 This bathroom is so glamorously beautiful. I just have one burning question: what is holding up that narrow glass shelf above the sink? Are there brackets? Yes, there are little chrome brackets that just screw into studs in the walls and then have small padded screws on the bottom which hold the glass in place. Very similar to this! Exactly my question too, SLG. I’ve got some of the same issues as Ana: interior postage stamp-sized bathroom. ; unfortunately no marble though. Beautiful, Daniel!! I love that sink! I know it was there in the ‘before’, but your upgrades made it really the standout piece that it was meant to be. Before, the vintage style of it in the ‘builder’s box” looked to me like it was mis-placed in time. Now with the wainscoating, and the lighting, it looks like it was meant to be. Framing out the mirror was a good call, too. I can’t wait to see the rest of this job. Congrats on the jump to “professional” status. If I didn’t live half a continent away (and wasn’t broke LOL), I would SO hire you. Once again you have outdone yourself Daniel! 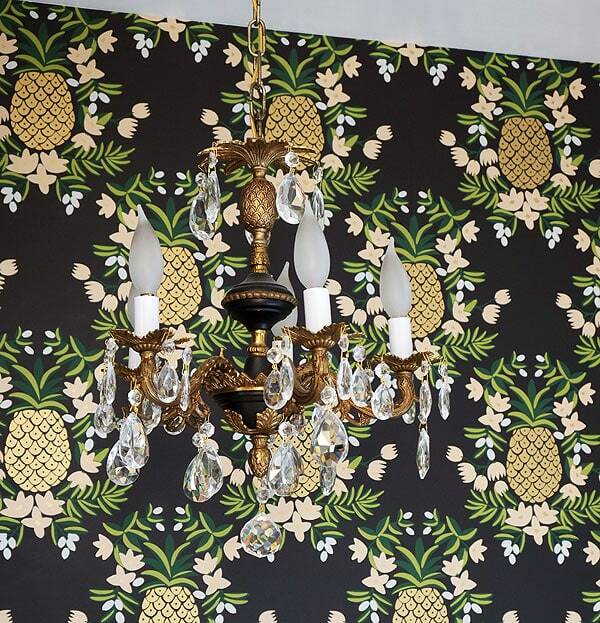 I’m in love with the crystal chandeliers and the wallpaper… Awesome job! Beautiful, just beautiful. Kudos on a job well-done. And kudos to Ana Gasteyer for having good taste in selecting you for the job. Fantastic…..did you get her to do Martha for you while you were working? AAAHHHHHHHHHH to EVERYTHING ABOUT THIS. Ana, pineapples, dat bright white panelling. I am In. Love. Amazing as always! I love it! 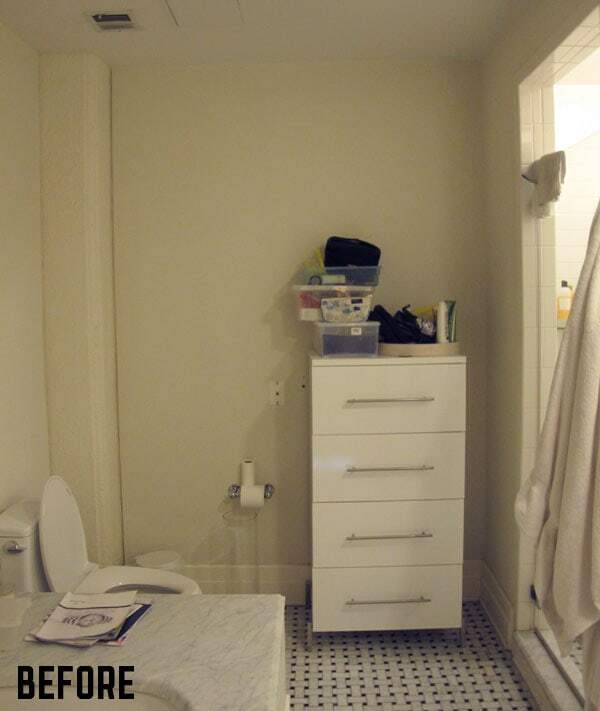 Makes me want to go home and do something, anything, to my crappy little rental bathroom! And I, too, would hire you in a heartbeat. Note to self: start saving. But I am surprised that an inside bathroom – which is what I have, too – is not required to have a fan to clear out the moisture. My bathroom gets pretty steamy even with a vent and fan! Is there no ceiling vent at all? The building code actually allows that? I’m guessing in NYC there are a lot of buildings with no bathroom fans, kitchen fans or other things that are required “everywhere else”. Partly because super old buildings just didn’t have those things (although usually there’s a window, maybe). I just leave the door open to the bathroom all the time but I guess that just dissipates the steam to the rest of my house. Daniel, you’ve updated 3 bathrooms while in the same time i’ve not finished my one. First step, must make plans to replace water supply lines this year so I can get started on the tile. You know, I don’t actually know what the current local building code in NYC is surrounding vents in bathrooms. I do think it’s required in most places, but New York can be very weird that way. There’s an A/C vent but no fan/vent for the moisture, but the building was also renovated around 15 years ago, and a lot has even changed since then! So I’m not sure. I am so glad you’re sharing your talents with the world at large! You have such a good eye and a great imagination/creative spirit. I hope you’ll share more of your professional projects on the blog! First, its looks great! 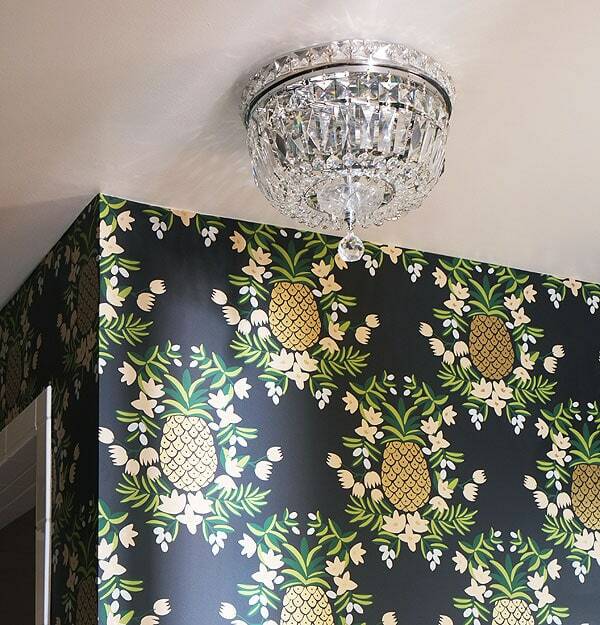 Pineapples to me are usually a “welcome to my house” motif, but I like this look. 1. 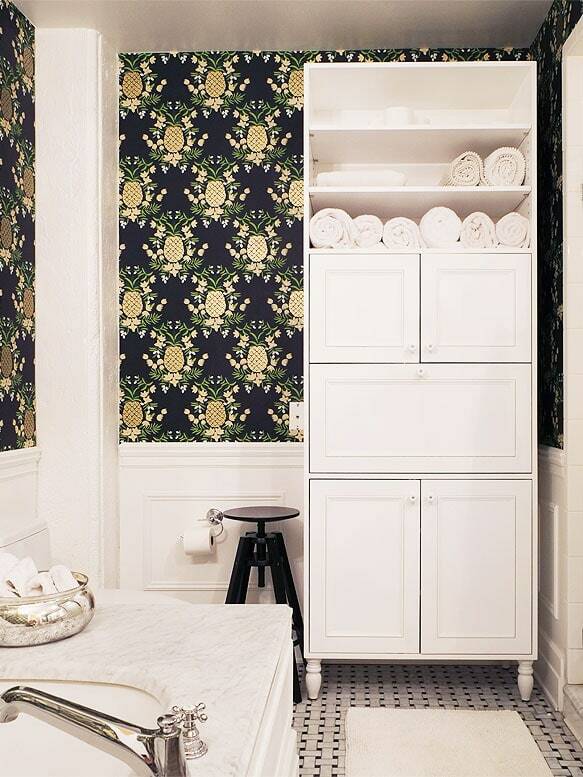 Why build free standing furniture rather than built in storage making that vanity floor to ceiling? 2. What about the door? I’m sure its a better door than it looks like, but I’m getting core door vibes from my father’s 1970s renovations! The original concept for the cabinet/vanity was to make it a true built-in, but the cabinet maker suggested making it freestanding instead—partially to work with the existing baseboards (more demo = more work = more $)—and partially for the speed of building and ease of install. To be completely honest, I don’t think the cabinet-maker ended up being a great fit for the job for a number of reasons, so while the final product is functional and looks good, it’s kind of the one thing that I think Ana and I would tweak if we could do it all over again. great job. I’m curious how you framed out the mirror? is it possible you could do a brief run down? Well, I didn’t actually personally do it, but I’m almost positive that the molding that was purchased was made as frame molding, so it was routed out a bit on the back where it had to overlap the mirror so that the outer edges would sit flush with the wall. I believe the carpenter installed it all in place (I’m guessing with some kind of adhesive on the walls and brad nails) and then patched, caulked, and did final paint touch-ups when it was in place. The mirror is HUGE and really heavy, so I think this was the most cost-effective and easy solution. It’s not going anywhere ANY time soon, so there wasn’t a whole lot of sense in making the job more elaborate than it needed to be! Sublime! You may have found your calling Daniel. LOVE the chandelier. I love how you mix luxe with the affordable and always make it look like a million dollars. Well done! I think your true genius shows in your ability to make a stunningly gorgeous room which is truly the client’s. A lot of designers have rooms which all look alike. As soon as I win the lottery I hope you will transform my life (without, of course, interfering with progress on the Kingston house). So after loving the wallpaper you put up in your office, I started looking at Hygge & West. Loved their stuff. 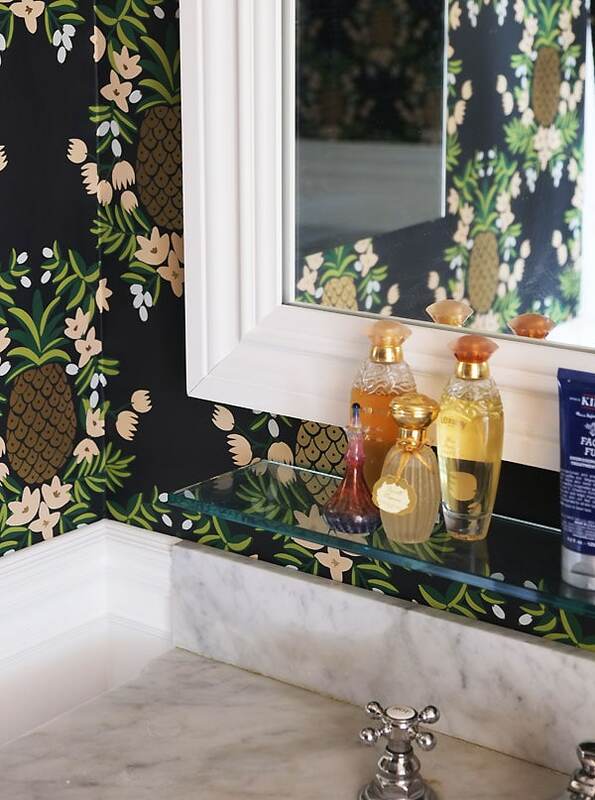 Then Rifle Paper Co did the collab and I was obsessed with this black pineapple wall paper. THEN you posted about using it in this bathroom and I just nearly died of obsession and joy. So, because of your discount, and because I have very little self control, I bought some. I live in a rental in Manhattan and have absolutely nowhere to put it, unless I wall paper the backs of my black floor to ceiling bookcases, but MY GOD THIS PAPER IS BEAUTIFUL and I just don’t really know how I can be expected to live without it. If you want to come over and help one of your readers wall paper a bookcase…that would be swell. I have no clue what I am doing. Pray for me. And pray for my husband who has to live through this DIY. Pretty sure that is the best bathroom makeover ever. I love everything. You are clearly a guru. Please come do my bathroom. Amazing job, Daniel!!!! We’re all so excited over here to see how it turned out (even more beautiful that we could have imagined). So chic and glam, but still not taking itself too seriously… Perfecto! I am so sorry to ask this dumb questions but I can’t find the 20% discount code anywhere on the page. Is it possible to let me know what it is? Thank you so much! I’ve wanted to go dark in one of my bathrooms (also in the middle of my house), but was concerned about the lack of natural light. Any tips/guidelines you can offer about what makes dark (whether wallpaper or paint) work in small spaces with no natural light? this is amazing, daniel!! congratulations – looks so fantastic, and what a fun client! Being a fan of Rifle Paper Company I am excited to hear they now make wallpaper. This bathroom is so beautiful. 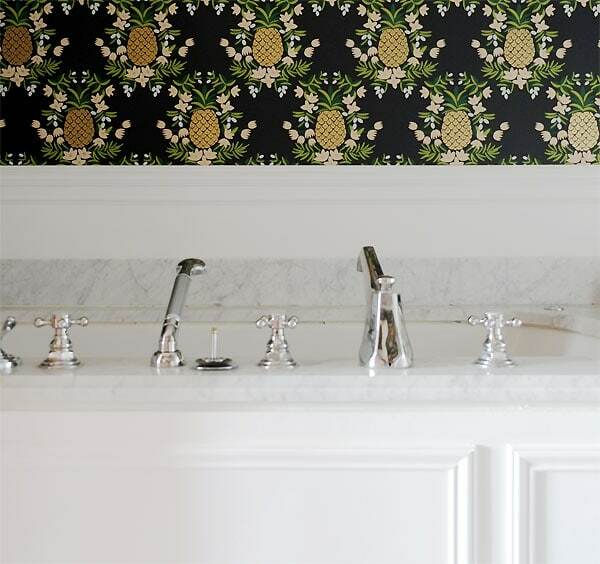 I especially love how you use fixtures from Overstock and Home Depot and make them look luxe. I can’t wait to see the rest of the place! This is so amazing! That wallpaper is gorgeous! You make everything look so effortlessly awesome. you are so clever! I would have thought this was a full re-do but the small changes made such a huge difference, really smart and elegant. Would love to see the rest of the apartment -congrats! Are ya kidding me???? This is gorgeous! You are an evil genius. Commence pinning the shiz out of this room. If you put a cabinet under the sink you’d have more storage space! We considered that a lot, but the sinks/legs are so nice (and contributes to the bathroom feeling more spacious than it really is…) that we didn’t really want to mess with them! Oh! Those are basketweave marble floors. I thought they were stylized bones, which I would actually be pretty cool with. I am SUPER DUPER jealous that you spent time with the awesome Ana !!! 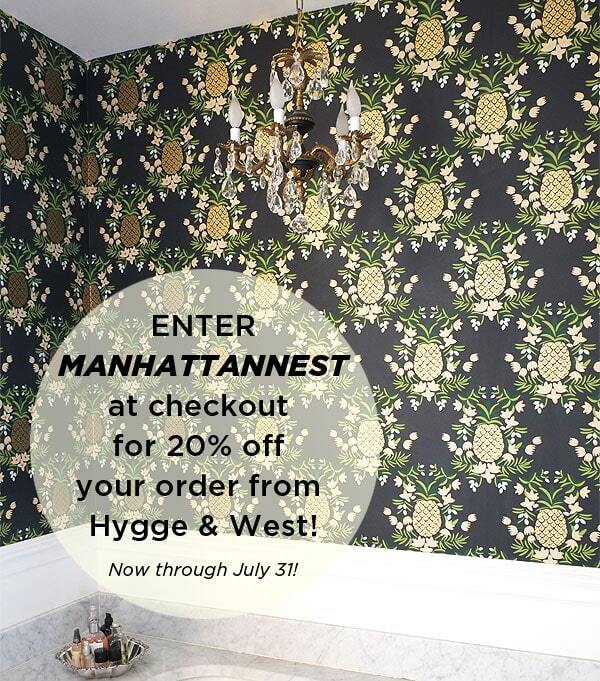 Oh and by the way, have I mentioned I would do all sorts of things for some Hygge & West wallpaper?? I have to find an australian stockist ASAP!!!! The whole bathroom looks AHMAZING! Gorgeous design work. 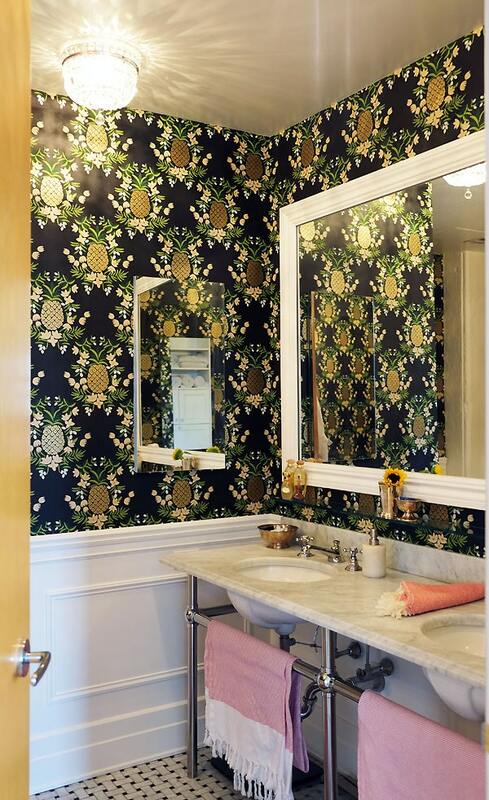 I am not generally a fan of wallpaper, mostly I think as a legacy of growing up in the 60s and 70s where everything single wall in the house was wallpaper covered, which could be a real assault to the eyes. However, I must say I really like this wallpaper, has a sort of William Morris style to it. This is AMAZING!! I love that wallpaper…like so freakin hard. Oh and the light fixture..thats not bad to look at either. Congrats on a job very well done! Love every single thing about it – amazing job!! Just gorgeous, must be a lovely place to be now. Fabulous work! 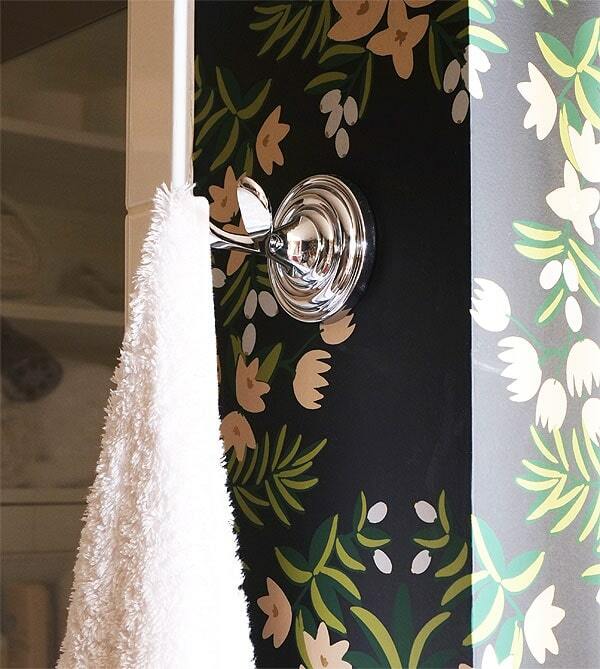 I’ve seen the dark option in a small bathroom–rich red, black and gold in a tiny, under-the-stairs powder room. Would you consider a tarnished gold leaf on the mirror frame, to tie it back to the wallpaper, still keeping it luxe? 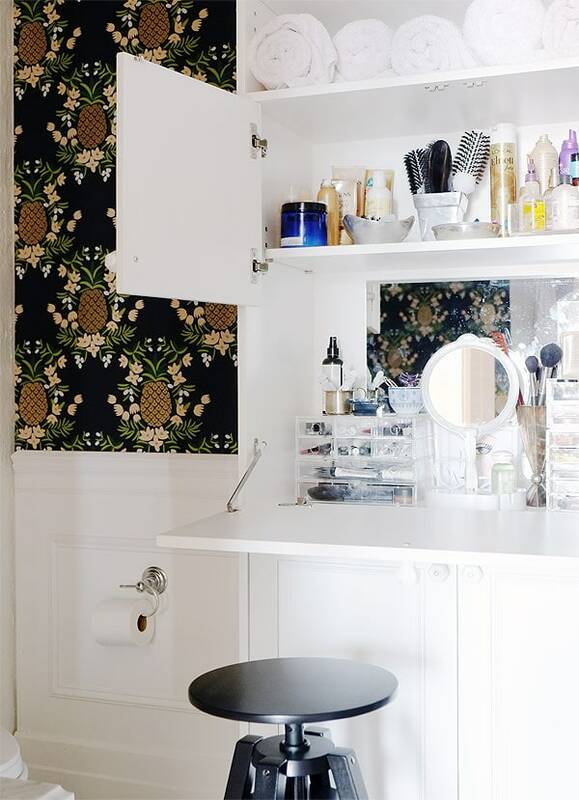 Your vanity table solution is perfect. Love your courage and ingenuity–and the telling, thanks. WOW! This room is absolutely stunning! I would love to use this wallpaper on an accent wall in my dining room. Could you suggest a paint color to compliment? Actually, yes! 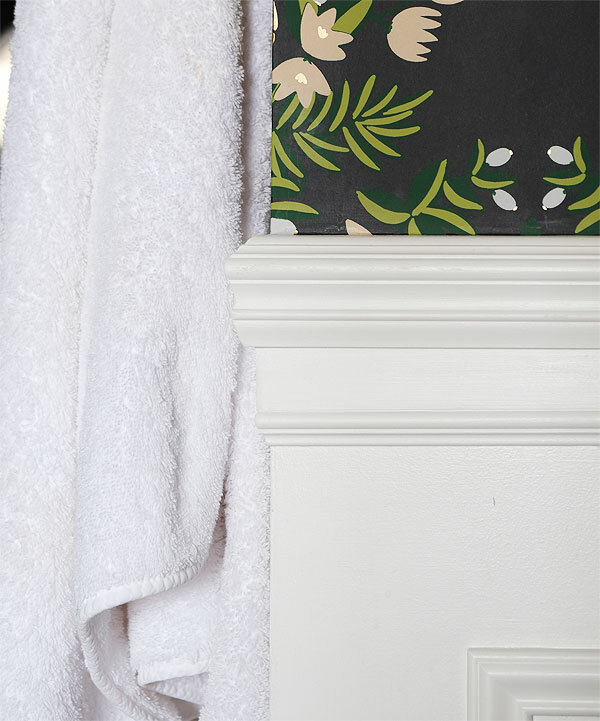 If you want to go really dramatic and do the room all-black with the wallpaper as an accent, Benjamin Moore’s Black Berry is the closest match to the black background in the wallpaper. Otherwise, I’d look for one of the other colors in the wallpaper and maybe go a few steps lighter, if you wanted, or just choose a nice neutral white/grey for the other walls. It just depends on what you want! ← The Great Radiator Shuffle!